Now that the California Legislature has started its summer break, it seems the media attention of late has been focused in the Opinion pages. This is true of my last UPDATE (see MOORLACH UPDATE — Watching Our Votes — July 4, 2018). In the first editorial below, The Sacramento Bee has a piece about SB 1004 on its website by former Assemblywoman Cheryl Brown. I enjoyed working with Ms. Brown and built a good relationship with her while she was in Sacramento, during my first half-term. Because of my affection for Ms. Brown, allow me to provide more detail than normal and to share two themes that have been evolving recently in my life. The first is building relationships with members across the aisle (see MOORLACH UPDATE — AB 521 — November 12, 2015). On occasion, I will coauthor a bill introduced by a Democratic Legislator. This year I upped the game and Joint Authored two bills with Democratic Senators. Senate Bill 1206, the No Place Like Home Act of 2018 was introduced by Senator, and former President Pro Tem, Kevin De Leon and myself (see http://leginfo.legislature.ca.gov/faces/billTextClient.xhtml?bill_id=201720180SB1206). It was recently replaced by Assembly Bill 1827, a budget trailer bill, due to the urgency of needing to get this measure on the November ballot (see http://leginfo.legislature.ca.gov/faces/billTextClient.xhtml?bill_id=201720180AB1827&search_keywords=no+place+like+home). For more background on this proposal, see MOORLACH UPDATE — SB 1273 and MCO Tax — February 27, 2016. You will see this effort as Proposition 2 on the November General Election ballot. You know that I usually oppose general obligation bonds, but this proposed bond has an existing revenue stream to pay the principal and interest. I would call this technique hypothecating or securitizing an income stream to get the principal up front in order to begin constructing or investing in a project immediately. The revenue source is the Mental Health Services Act (MHSA), created by voter approval through Proposition 63 of 2004. It is also known as the millionaires tax, so the revenues should be reliable as long as wealthy residents are willing to pay for the great weather. I say this, as there are signs that high net worth individuals have been leaving the state since the passage of Gov. Brown’s income tax increase resulting from the successful passage of Proposition 30 in 2012. This was a proposition that I opposed (see MOORLACH UPDATE — Costa Mesa Voter’s Guide — October 6, 2012 ). The MHSA revenues helped me to find funding to implement Laura’s Law in Orange County through the passage of SB 585 (Steinberg). It also helped me to change state law to provide more crisis stabilization unit beds to assist our public safety officials when they encounter an individual facing a mental health crisis (see MOORLACH UPDATE — Mentally Ill Inmates — June 11, 2016). Appreciating this strategy, I was an early supporter of the No Place Like Home effort by Sen. De Leon, which uses a small percentage of MHSA revenues to repay the bondholders. The proceeds will be used to construct or refurbish immediate housing for the mentally ill homeless population. This year I also joint authored Senate Bill 1004 with Sen. Scott Wiener of San Francisco (see http://leginfo.legislature.ca.gov/faces/billTextClient.xhtml?bill_id=201720180SB1004). This bill focuses on prevention and early intervention, as mental illness is showing up in impacted children as early as age 14. The sooner it is diagnosed, the better the opportunity to implement appropriate strategies. A great example would be CHOC’s pediatric psychology efforts, a new treasure in my District, which I mentioned in my May 1st UPDATE (see https://www.choc.org/programs-services/mental-health/). Why do I provide so much detail? Because the MHSA is rather vague and has confused counties to such a degree that they have accumulated nearly $2.5 billion in unspent funds. Consequently, providing some clarity in this area would be helpful. Which brings me to the second theme. I have found myself focusing on the topic of mental illness. It started while I was a County Supervisor in trying to understand and implement Laura’s Law (see MOORLACH UPDATE — Laura’s Law Journey — August 11, 2014). This evolution has found me joining the Mental Health Caucus and being appointed this year to the Senate Select Committee on Mental Health. I remind everyone that I was a business major, not a pre-med major. So, this has been an education for me over the past dozen years or so, starting with the killing of Kelly Thomas in Fullerton (see MOORLACH UPDATE — Kelly Thomas Reverberations — January 15, 2014). With that, I joined Sen. Wiener to provide clarity. SB 1004 seeks to clarify where some of the funding should be prioritized. Former Assemblywoman Brown fears this will impact the share of the pie for the elderly. I believe this fear is unfounded. Instead of opposing the bill, she should work with me and others in the Mental Health Caucus to draft a bill that focuses funding attention for the elderly and even pursues an effort to classify dementia and Alzheimer’s as mental illnesses eligible for MHSA funds. The second column is in the Press-Enterprise and Daily Breeze and it follows the theme recently presented in MOORLACH UPDATE — Janus Decision — June 28, 2018. It refers to an effort I pursued last year (see MOORLACH UPDATE — There Ought Not Be A Law — April 23, 2017 and MOORLACH UPDATE — Earning a Living — November 30, 2017). Ironically, the argument that Sen. Morrell received for stopping his efforts was the same one used to kill my bill. What a tragedy that Assemblyman Low would bow to the pressures of an industry group’s representatives in attendance with their weak opposition argument, but could totally ignore the long line of opponents to his bill, AB 2943, when it recently came before the Senate Judiciary Committee, of which I am Vice Chair. All the more when the number of individuals wishing to testify against his bill was so large that they had to fill the balcony of the Senate’s largest hearing room and the hallways, requiring one and one-half hours to let them all come to the microphone. The ironies continue. An important measure to expand access to mental health care services in California is going through the Legislature, but it would make it more difficult for counties to serve older adults. Senate Bill 1004, which was approved by the Assembly Health Committee on June 19, would amend Proposition 63, passed by voters in 2004 to provide funding for county mental health services with a 1 percent tax on annual incomes of more than $1 million. Sens. Scott Wiener, D-San Francisco, and John Moorlach, R-Costa Mesa, who introduced SB 1004, appear to be at odds with the needs of older adults because the bill shifts the focus of the Mental Health Services Act primarily to young people. The bill says that 75 percent of mental illnesses begin by 14 years of age, citing a study showing the relationship between early trauma and life-long problems. Most of them grew up when mental health problems were less understood, diagnosed or appropriately treated. As a result, many tend to shy away from mental health services. Yet adults between 45 and 64 old are at the highest risk for suicide nationally, and in recent years California’s suicide rate among adults 65 and older has been higher than the national average. The senior community believes that SB 1004 should also address the mental health needs of seniors as much MHSA money remains unspent. The California Commission on Aging offered amendments stressing that older adults are also at risk of anxiety depression, anxiety, psychological traumas and suicide. Sadly, the Assembly Health Committee did not consider the amendments. As a result, the Commission on Aging opposes SB 1004 because it would make it more difficult for seniors to secure the mental health services they need. Cheryl Brown is a member of the California Commission on Aging and former chairwoman of the Assembly Committee on Aging and Long-Term Care. She can be contacted at cheryl1242. SACRAMENTO — One of my favorite Ronald Reagan quotations illustrates the problem of an ever-growing government: “Government programs, once launched, never disappear. Actually, a government bureau is the nearest thing to eternal life we’ll ever see on this Earth!” In my decades covering public agencies, I can think of only a handful of rollbacks — and they usually ended up perversely expanding government power. In one recent case, the state Legislature gutted a state tax board, known as the Board of Equalization. But its powers merely were shifted from elected officials to bureaucrats in different agencies — and now California taxpayers are more frequently getting the shaft. That’s how government works. Last week, a simple bill (sponsored by my employer, the R Street Institute) would have rolled back licensing requirements for only one of the hundreds of trades and professions that require a state license to work. Burdensome education requirements, fees and testing become obstacles for lower-income people to get gainful employment that doesn’t involve flipping burgers. The requirements often have no relevance to public safety, but usually are the result of powerful interest groups that use government to lock up some part of the market. Last year, Sen. John Moorlach, R-Costa Mesa, introduced a bill that would have eliminated such requirements in a variety of fields, but it was a non-starter given its broad scope. It was referred to multiple committees and dead on arrival. So this year Sen. Mike Morrell, R-Rancho Cucamonga, introduced legislation that targeted one particular — and particularly ridiculous — set of licensing rules involving people who want to shampoo, arrange, dress and curl (but not cut) hair for a living. Did I mention that a shampooer needs 1,500 hours of training, whereas a first responder/emergency medical technician only needs 120 to 150 hours of training? The Morrell bill passed the full Senate with only two “no” votes, but was killed last week in the Assembly Business and Professions Committee on a 14-3 vote in spite of the fact that most of us have shampooed our own hair for years without calamity. The hearing room was packed with students from local cosmetology schools. It should surprise no one that the main beneficiaries of the current rules are the schools that charge hefty tuitions for such training, nor should it be a surprise that the state bureaucracy (the Department of Consumer Affairs) estimated excessive fee-revenue losses if the bill became law. Those estimates are hard to fathom given how unimaginable it is that people currently go through the whole licensing rigmarole and then only use the degree mainly to shampoo and arrange hair. But government agencies see any kind of minor regulatory rollbacks as a threat to their authority. There’s always that fear of the slippery slope. There’s also an economic term known as “regulatory capture.” It’s typical in all aspects of government for industries that are being regulated to dominate the agencies that do the regulating. The main argument that the Assembly Business and Professions Committee Chairman Evan Low, D-San Jose, used to oppose the bill is that the issue can be handled in the forthcoming Sunset Review hearings. The Assembly and Senate business and professions committees hold these annual hearings in the fall to “discuss the performance of the boards and make recommendations for improvements,” according to the legislative website. The term “sunset” comes from the legislation, which would sunset the many boards out of existence unless they justify their existence. This is one of those cool ideas that sounds much better in theory than in reality. Government agencies should indeed have to explain what they do to stay in business. But California’s Sunset Review process rarely leads to the sunset of anything. Senate Bill 999’s opponents note that the review led to legislation last year that eliminated the Board of Guide Dogs for the Blind. That was a welcome development, but the elimination of that pointless board was backed by regulators and the industry itself. By contrast, SB999 is opposed by the beauty industry and the bureaucracy. Nevertheless, I’ll take legislators at their word and closely watch as they advocate for the end of onerous regulations that benefit business owners at the expense of aspiring low-income workers. Wouldn’t it be great if California’s Legislature turned out to be the exception that proved Reagan’s rule? Steven Greenhut is Western region director for the R Street Institute. He was a Register editorial writer from 1998-2009. Write to him at sgreenhut. This e-mail has been sent by California State Senator John M. W. Moorlach, 37th District. If you no longer wish to subscribe, just let me know by responding with a request to do so. The favorable Janus decision by the United States Supreme Court was announced yesterday. The Daily Journal covers it in the first piece below. This is very big news. Especially in a state that is run by public employee union officials. One can only hope that it is a game changer and that it provides some appropriate fiscal relief in Sacramento. Let me expand on this piece. As a result of public employee unions using a significant portion of the dues they collect to campaign for candidates and elected officials who decide on their salary and benefit packages, which is the largest conflict of interest in this industry, most municipalities find themselves in fiscal distress. My recently released Unrestricted Net Deficit Per Capita listings illustrate this tragic conundrum. The significant amount of campaign “slush fund” cash allows unions as leverage and is extremely intimidating when negotiating with insecure elected officials at the bargaining table . Hopefully, future negotiations will be based on the merits of the proposals and not on the inference that another candidate will be backed to run against those currently in office. And, if the taxpayers are fortunate, maybe some of the fiscal benefit overreaches by the public employee unions of the past can be reversed in order to protect the financial sustainability of their public employers. The third piece is an electronic editorial in the Daily Breeze by the OC Register. It gives a shout out to my SB 247 (see https://moorlach.cssrc.us/content/senate-bill-247-reducing-occupational-licensing-laws and MOORLACH UPDATE — Earning a Living — November 30, 2017) . The fourth piece recognizes my Small Business of the Year recipient for 2018 in the Orange County Breeze. Bruce and Lisa Hughes were two of my Becker CPA Review Course instructors forty years ago. Both have also served with distinction on Orange County committees focused on the County’s fiscal well-being. Congratulations to a couple that have invested heavily over the decades in service to the County of Orange. In the wake of a U.S. Supreme Court decision cutting off unions’ ability to collect fees from non-union workers delivered Wednesday, those standing behind local labor unions expressed a mixture of disappointment and renewed energy around their efforts. By striking down the use of mandatory fees paid by nonmembers of public worker unions toward collective bargaining activities, the court’s ruling marked an end to the collection of agency fees, or fair share fees, used toward the expenses of contract negotiations and grievance handling by public sector unions. Allowed in 22 states including California, the fees are less than union dues and may not be used for political activities. Unions are required to represent all workers whether or not they are union members. The court’s 5-4 vote in an Illinois case in which a state worker, child support specialist Mark Janus, challenged the agency fees, split the nine justices, five of whom joined Justice Samuel Alito in asserting the fees violate the constitutional First Amendment right of free speech. “We conclude that this arrangement violates the free speech rights of nonmembers by compelling them to subsidize private speech on matters of substantial public concern,” wrote Alito in his opinion. Their decision sparked reactions from workers representing a wide array of unions as well as those shaping policy across the state, some of whom were buoyed and others who were discouraged by the news. Representing the San Mateo Labor Council as its executive secretary-treasurer, Julie Lind Rupp condemned the decision as counter to the labor movement’s belief that all work has dignity, deserves respect and all workers deserve to be treated accordingly. But for State Sen. John Moorlach, R-Costa Mesa, the decision was not only a win for those workers who have had a portion of their paychecks go to causes they may not support, it was also a source of hope that the hold unions have had on their negotiators might loosen. Moorlach looked to the change to limit unions from coming close to threatening elected officials at the negotiating table and unwind some of the effects of the “slush fund” they have amassed in Sacramento, which he said has been used to tie up a considerable number of taxpayer dollars. “That is just unfair and inappropriate, so this should help the unions step up their game to focus on the merits of the deal,” he said. Having worked at the Palo Alto wastewater treatment plant for some 23 years, Margaret Adkins, Palo Alto chapter chair of Service Employee International Union, Local 521, spoke to the benefits of collective bargaining, which she said enabled workers to adequately provide for their families. Without union representation, workers’ earnings are at the discretion of management, said Adkins, who added that though nobody is forced to pay dues, many opt to because they recognize they are better able to advocate for themselves if they do. Adkins was not convinced the ruling would diminish the ability of unions to advocate for workers, and said it’s widely recognized that large, powerful industries are behind the push to take away workers’ rights. California Teachers Association President Eric C. Heins agreed the decision was the result of a well-funded and nationally orchestrated effort to weaken the ability of workers to convene and speak in a united voice. By overturning precedence set by Abood v. Detroit Board of Education more than 40 years ago, the court’s ruling adopted a radical interpretation of the First Amendment and stands in the way of public teachers providing quality education for their students, said Heins. Though Assemblyman Kevin Mullin, D-South San Francisco, was still processing how the decision could play out, he voiced concern about its impact on working people throughout the country. Bay City News Service contributed to this report. Editor’s note: Breaking views are thoughts from individual members of the editorial board on today’s headlines. Democratic politicians like to present themselves as advocates for the poor and working California. In reality, Democrats in Sacramento are too often merely proponents of leveraging bigger government to the benefit of politically advantageous special interest groups to the detriment of poor and working Californians. Their resistance to occupational licensing reform is a clear example of this tendency. Occupational licensing is sold to the public as necessary for the protection of the public and the professionalization of industries. In reality, occupational licensing is mostly a scheme by which members of an occupation use government to erect barriers to entry, limit competition and thereby raise costs to consumers. The Obama White House, Little Hoover Commission and the Trump administration alike have recognized the problems of overextended occupational licensing requirements. The Archbridge Institute has further noted an association nationwide between growth in occupational licensing and income inequality. For those naive enough to take the progressive rhetoric of California Democratic politicians at face value, one might think Democrats would be open to reforming policies which punish the poor the most and aggravate income inequality. Sure enough, the Democratic politicians in Sacramento would rather appease special interest groups than the poor. On June 26, the Assembly’s Business and Professions committee overwhelmingly rejected a modest proposal to eliminate occupational licensing requirements for shampooing, arranging, dressing, curling, waving, cleansing or beautifying hair. The bill, SB 999 from Sen. Mike Morrell, R-Rancho Cucamonga, was rejected with only 3 votes in favor, 14 opposed. These are the Assembly members who voted against it: Arambula, Bloom, Chiu, Cunningham, Eggman, Gipson, Grayson, Holden, Irwin, Low, McCarty, Medina, Mullin, Ting. “I’m just trying to have government work for us not against us and be our servant, not our master,” Morrell appealed to the committee. Of course, they intentionally conflated training requirements with occupational licensing. People who wish to make a living in shampooing, arranging, dressing, curling, waving, cleansing or beautifying hair will certainly learn how to do their jobs correctly and effectively, otherwise they wouldn’t get much business. Predictably, the industry also complained, with the Professional Beauty Association arguing the bill “would be detrimental to the California beauty industry.” No it wouldn’t. They just don’t want competition. Alas, California remains one of the most licensed states in the country. An Institute for Justice report looking at 102 lower-income occupations nationwide found that California licensed 76 of them, often with more onerous requirements than other states. It should be noted this isn’t the first time the Democrats killed a licensing reform bill. Last year, they killed a bill from Sen. John Moorlach, R-Costa Mesa, to repeal licensing requirements for a handful of lower-income jobs. It’s what they do. While Democratic politicians might continue to fool poor Californians into thinking they’re on their side, the reality is the Democratic establishment cares only about self-preservation. Doing what’s right isn’t of interest to the Democratic establishment, only what is self-serving. It’s no wonder California leads the nation in poverty. On June 19, 2018, Senator John Moorlach honored Hughes & Hughes, LLP, a prominent family law firm in Tustin as the 2018 California Small Business Association Honoree for Senate District 37. Headed by partners Lisa and Bruce Hughes, the firm combines solid experience in complex family law issues with sensitivity to the emotions and feelings of their clients. All firm lawyers and legal aides help guide clients through the legal proceedings quickly to return each client to peace of mind and normalcy. The partners also work to lend legal expertise to successfully improve the laws of the State of California. In particular, Bruce and Lisa Hughes worked with Senator Moorlach from 2015-16 to pass Senate Bill 1255, which clarified a previous California Supreme Court decision which blurred the date of separation guidelines for dissolving marriages. SB 1255 became the first bill from Senator Moorlach that Governor Jerry Brown signed into law, becoming California Family Code Section 70. Like Senator Moorlach, both Bruce and Lisa are Certified Public Accountants, enabling them to handle the most intricate accounting and financial practices typical to unique circumstances. From their Orange County base, Hughes & Hughes serves families throughout Southern California. This article was released by the Office of Senator John Moorlach. Senator John Moorlach honored Hughes & Hughes, LLP as the 2018 California Small Business Association Honoree. Courtesy photo. Greetings from San Antonio, Texas (Bexar County), where I’m touring the Haven for Hope facilities (see MOORLACH UPDATE — Legislative Efforts — June 29, 2017). It’s bill introduction season, and The Daily Breeze and Daily Democrat, in the first piece below, provide the details of an effort by Senator Pat Bates, that I endorse. And, it fits in with the reason for my being here in Texas. The second piece, from the Pinetree Net, provides the details of an award I was presented this week. It’s very humbling and gratifying to be recognized by my former Supervisorial colleagues around the state. I am most appreciative of the relationships that I formed with them over my eight years as an Orange County Supervisor. Also see MOORLACH UPDATE — Burning Year End Issues — December 15, 2017. The third piece provides another perspective on the Governor’s proposed budget and is found in the San Gabriel Valley News and the Press Enterprise (see MOORLACH UPDATE — Budget and Legacy Priorities — January 11, 2018 and MOORLACH UPDATE — 2018-2019 Budget Recommendations — January 4, 2018). Outraged by reports of “patient brokering” and neighborhood turmoil, Sen. Pat Bates introduced legislation Wednesday to start addressing dangerous and deadly practices in California’s poorly-regulated addiction treatment industry. 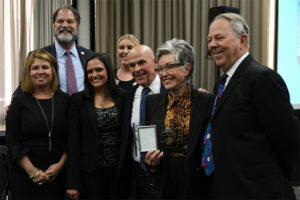 “For more than 20 years, several bipartisan efforts to address the challenges surrounding the state’s drug rehab history have gone nowhere due to opposition from vested interests,” said Bates, R-Laguna Niguel. SCNG’s probe found that as opioid addiction has soared, unscrupulous rehab operators have rushed in to take advantage of mandatory mental health treatment coverage required by the Affordable Care Act. Broke and homeless heroin addicts are worth hundreds of thousands of dollars each in the form of insurance payments, and many are bought, sold and exploited in an underworld rife with kickbacks, drug use and fraud that can end in death. The bill, SB 902 is still a work-in-progress, she said, with language to be crafted with the help of those involved. She wants to improve patient well-being and increase public safety of neighborhoods hosting rehabs and sober living homes, she said, and aims to stop the industry’s bad actors, not those with strong records of helping people. In 2016, the Senate Health Committee rejected her SB 1283 that would have allowed a city or county to craft health and safety standards specifically for sober living homes. In November, a bipartisan group of the U.S. House of Representatives’ Energy and Commerce Committee asked California and five other states for information on allegations of patient brokering. The parents of several young adults who have died in treatment centers have called on Gov. Jerry Brown to lead on this issue. Brown’s office declined to comment on Bates’ push for action. Sen. John Moorlach, R-Costa Mesa, represents an area that’s home to one of the densest concentrations of rehabs in the state. Sacramento, CA…The Rural County Representatives of California (RCRC) installed its 2018 Officers and presented its Rural Leadership Awards at their annual reception in Sacramento yesterday. Humboldt County Supervisor Rex Bohn was installed as Chair, Tuolumne County Supervisor Randy Hanvelt was installed as First Vice Chair, and Inyo County Supervisor Matt Kingsley was installed as Second Vice Chair. Tehama County Supervisor Bob Williams remains an Officer as Immediate Past Chair. The newly installed 2018 Officers will lead the organization in championing policies on behalf of California’s rural counties. In addition to the Installation of Officers, Rural Leadership Awards were presented to two officials who have demonstrated an understanding of, and leadership in, rural issues and the unique challenges that rural communities face. Assembly Member Anna Caballero (D-Monterey) was the first recipient of the 2017 Rural Leadership Award. Senator John Moorlach (R-Orange) was the second recipient of the 2017 Rural Leadership Award. Details on RCRC’s 2018 Executive Committee and other Committee Chairs can be accessed here. The Rural County Representatives of California (RCRC) is a thirty-five member county strong service organization that champions policies on behalf of California’s rural counties. RCRC is dedicated to representing the collective unique interests of its membership, providing legislative and regulatory representation at the State and Federal levels, and providing responsible services for its members to enhance and protect the quality of life in rural California counties. To learn more about RCRC, visit rcrcnet.org and follow @RuralCounties on Twitter. Gov. Jerry Brown has proposed the biggest state budget in history. He wants to spend $131.7 billion from the general fund, about 5 percent more than is being spent from the $125 billion 2016-17 budget he signed last year. His 16th and final budget also includes a surplus, which some lawmakers are looking at the same way a starving man looks at cheeseburger. “It’s a strange world where politicians are celebrating that the government took too much money from taxpayers, but that’s exactly what is happening with this budget surplus,” said Assembly Republican Leader Brian Dahle. The celebrants aren’t in full agreement over where that surplus should be applied, though. There might be some rising tensions between those who want to put it away and those ready to spend it. But that would be the wrong argument anyway. Brown’s proposed budget, which is actually a $190 billion spending package when bonds and special funds are included, projects a $6.1 billion surplus. Brown wants to use the surplus to boost the state’s Rainy Day Fund, which was the result of a bipartisan deal between Gov. Brown and then-Assembly Republican Leader Connie Conway and was approved by voters in 2014. His proposal would boost fund reserves to $13.5 billion. Those should be welcome words, since most politicians are impulsive. They prefer to spend taxpayers dollars on new, shiny — “exciting,” in Brown’s words — objects as soon as they get their hands on taxpayers’ money rather than attending to the affairs that are already under their administration. This mindset is why California’s roads have become such a rolling disaster. They have been neglected while policymakers have focused on more high-profile projects. Such as high-speed rail. It doesn’t take a grizzled cynic to think that Brown might be putting away money for his over-budget “bullet train.” Republican Sen. John Moorlach, R-Costa Mesa, certainly believes that could happen, and his suspicions are justified. The Assembly Transportation Committee recently rejected a bill written by Assemblyman Jim Patterson, a Fresno Republican, that would prohibit lawmakers from raiding fuel taxes collected for road repair and using the dollars to make bond payments on the high-speed rail project. If they’ll move money from the state’s highway account to the train, they’ll take it from the Rainy Day Fund for the same purpose. While Brown says he wants to bank money, some Democratic leaders are almost salivating over the prospect of spending the surplus right away. One might think that there would be an intense demand for the surplus to instead be returned to taxpayers in the form of rebates. There isn’t. But this is where any argument about the surplus should be centered. The taxpayers were overcharged and that money belongs to them. Though uncommon, rebates would not be unprecedented. Gov. George Deukmejian sent refunds in 1987. If none are issued for this surplus, the LAO says the state could be “highly vulnerable” to litigation because Brown is violating “the spirit of Proposition 4” by not counting “$22 billion of school-related spending toward the state’s appropriations limit” established by the law. The threat of a lawsuit isn’t likely to move Sacramento. So if no rebates are coming, the surplus would be put to better use by dedicating it to paying down the state debt, which has reached $221 billion, according to the California Policy Center — and funding public employee pensions, which could be underfunded by $600 billion. Sacramento, though, is programmed to spend. As usual, this won’t end well for the taxpayers. Also follow me on Facebook & Twitter @SenatorMoorlach.